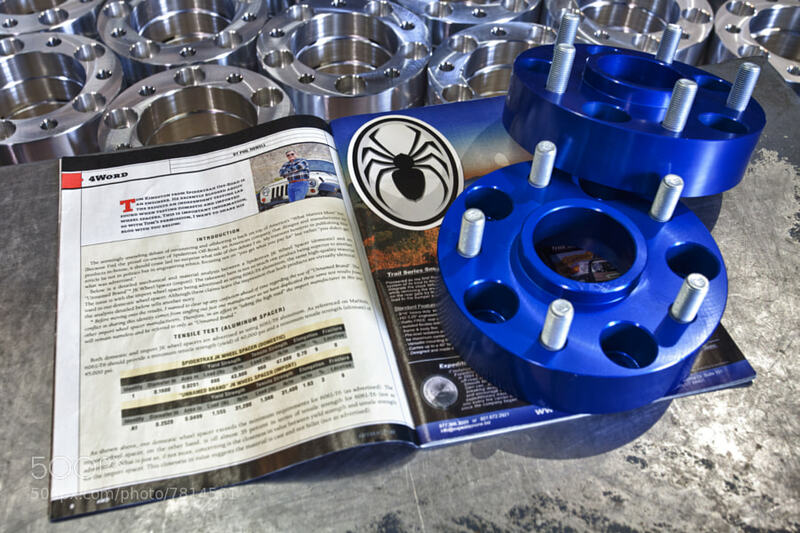 The Spidertrax Blog » 4Word with Spidertrax Wheel Spacers. Home > Wheel Spacers	> 4Word with Spidertrax Wheel Spacers. 4Word with Spidertrax Wheel Spacers. We have the great honor and privilege of being part of Phil Howell’s most recent 4Word in the July issue of 4Wheel Drive Magazine. In it, Phil republishes an online article we wrote back in September of 2010 discussing the differences between our in-house manufactured wheel spacers and an unamed brand import spacer. Before we repost our original blog article below for your reading enjoyment, there’s one quick disclaimer we’d like to make. The artcile as it stands is 100% accurate, so nothing changes there. Looking back however, we’d wish for possibly a better title than “Domestic vs. Import”. In the end, this is a poor choice of words as quality products can be made, well, anywhere. The article wasn’t intended to sell the idea that quality products can’t be made outside the US, rather it attempts to focus on the well documented issues of outsourcing (domestic or import) vs in-house production. As this article demonstrates, the disconnect between retailer and manufacturer is increasing to the point where retailers have honestly no clue what they are actually selling. Sure, on paper they are told by the outsourced manufacturer “Yes, this product is certified 6061T6.” but in the end this means little to nothing, leaving only finger pointing as a end all solution. So, in our revised summary, we’ll say next time you purchase a product, any product for that matter, ask where and who it’s made by. If the retailer is unable, or unwilling, to answer that simple question be very cautious. Published on September 2nd, 2010. Original article can be found here.